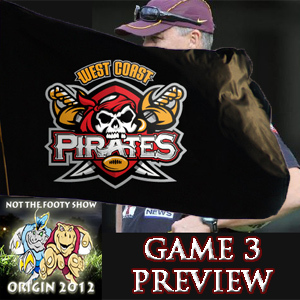 West Coast Pirates reveal Anthony Griffin as first coach! Get NOT The Footy Show Episode 113 hosted by Warrick Nicolson and newbie Jake Hauritz and hear all about what QLD and NSW should do with their injuries heading into the Game 3 Decider, why Ben Barba would've scared the life out of NSW, Maria Tsialis joins us to debate the value of mid-season Player Transfers and reveal the inaugural 17 players who will allegedly sign for the West Coast Pirates in 2013. Plus a full odds preview of Round 17 with all our picks and Special Fried Rice selections. NOT The Footy Show will be back on the weekend with more Origin 3 predictions from resident QLDer Matt Duncan in a short Podcast and the prognostications of the whole crew. Right Click Save Target As This Link if you don't have iTunes for the MP3 File. NOT The Footy Show will release another Podcast next Thursday night - July 5 with our Origin 3 Review Show. You can watch or listen the whole show that was streamed live via a replay you can start at any time here http://www.ustream.tv/channel/not-the-footy-show.